Bose has just released two portable audio products: the newBose QuietComfort 20 in-ear noise cancelling headphones and the all-new Bose SoundLink Mini Bluetooth speaker. The new QuietComfort 20 in-ear headphones are a first in-ear noise cancelling headphone from Bose, weighing in at just 1.5 ounces. These new QuietComfort 20 in-ear headphones are the result of 30 years of continuous research in noise reduction technology and incorporate more patented technology than any other Bose headphone to date. Within the QuietComfort 20 reside two tiny microphones in each earbud. The first mic senses sound from the outside, while the other registers sound eminating from inside. The two sets of measurements are processed by a digital electronic chip within the control module located on the cord. The chip calculates equal and opposite noise cancellation signals within a fraction of a millisecond, resulting in dramatic noise reduction. Bose TriPort technology uses ports to increase the effective acoustic space of the earbud to reproduce deep lows, and lifelike vocals and instruments, while Bose active equalization tunes the frequency response for improved sound. The QuietComfort 20 (QC20) headphones use proprietary StayHear+ ear tips which feature an improved conical design to ensure a better seal and incrase noise reduction, while improving on comfort. The QC20 headphones can be used in two ways, giving you control over what you hear and when. Owners can choose to block out the noisy world and enjoy their music. Or, with the push of a button on the cord’s Y-joint, the QC20 headphones switch to new Aware mode, which keeps the music playing, but allows surroundings to be heard clearly headphones to connect with the world. The QC20 can provide 16 hours of noise reduction of one charge but continues to provide non-active noise reduction operation, thereafter. An inline microphone and controls and provided in two different models: the QC20 headphones work with most Android, Windows and BlackBerry phones; the QC20i headphones are designed specifically for select iPhone, iPad and iPod models. 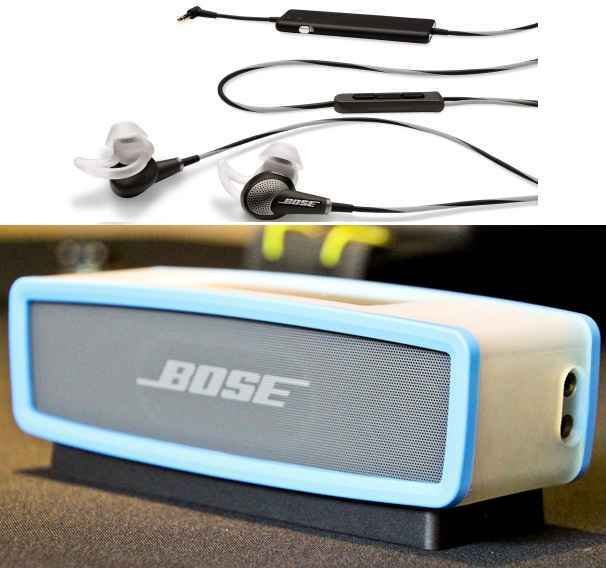 The second new portable music product newly releaseed by Bose is their new SoundLink Mini (SLM) speaker, which has wireless connectivity, while being small enought to fit in your had. At just 1.5 pounds, the SoundLink Mini speaker weighs no more than the average tablet. The SLM has an anodized aluminum housing that is scratch and fingerprint resistant while being durable enough for the rigors of everyday use. The SLM uses two new passive radiators with patented surround to reproduce its lowest low notes. The proprietary passive radiators are driven by new custom-designed, high-efficiency Bose transducers. Debuting in the SLM are the new Bose transducers, which are designed to move twice the air as conventional same-size transducers and deliver clear mid- and high-frequencies. To optimize the audio output, Bose digital signal processing is integrated for tonally balanced sound at any listening level. The SoundLink Mini speaker uses Bluetooth A2DP and a powerful antenna for a reliable wireless connection. A charging cradle and a rechargeable lithium-ion battery for up to seven hours of listening, make things that much more convenient. Accessory soft covers in orange, green and blue, and a travel bag, are also available for customization and convenience. The QuietComfort 20 and 20i headphones ae expected to be available in the summer of 2013 for $299.95 U.S., while the SoundLink Mini Bluetooth speaker will be available on July 11, 2013, for $199.95 U.S. SoundLine Mini accesory soft covers will retail for $24.95 U.S.; the travel bag for $44.95 U.S.